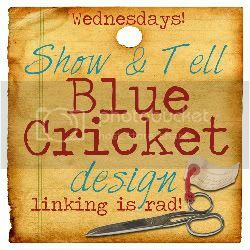 I bookmark at least 10 projects a week that I see on other blogs that I would love to try. Since all those items on my to-do list aren't going to make themselves, I'm doing something new on my blog. I'm taking the time once a week to make something that someone else has come up with that I really love. Plus, sometimes it's just nice to enjoy making something without having to take process pictures and write a tutorial, you know? Two weeks ago I made the Birthday Countdown Frame, and last week I made the Turtleneck to Zipped Pullover Refashion. This week it's the Pieced Jersey Dress from kojodesigns. So cute! 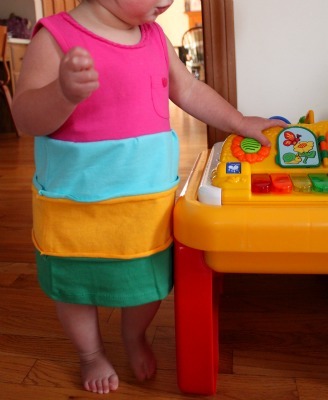 The kojo tutorial is for making a onesie into a dress, but I just used a tank top. 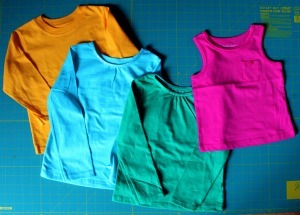 I purchased the pink tank top in my daughter's normal size (18 months) and three toddler t-shirts, one each in sizes 2T, 3T, and 4T, for $1 each. I love the exposed seams and not having to hem anything. Knits and I are warming up to one another. I kind of, sort of like them :) I banged this out in one naptime (about an hour). This dress will be perfect for the summer, but I'll be able to get away with putting her in it with a shirt under it this spring. Love how quick, easy, and cute this project was. I even have enough of the t-shirts left over to make a dress for my new niece that will be arriving in June. Wanna make your own? 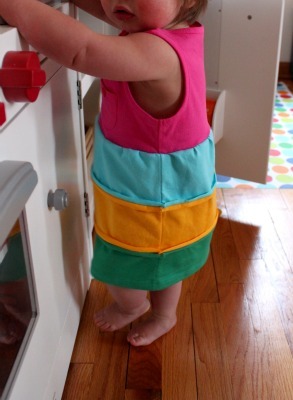 Click here to see the Pieced Jersey Dress tutorial over at kojodesigns and here to see three more variations of the same adorable dress. I also want to remind you that the first ever Point of View projects will be revealed on Friday! This month's theme was skirts, and I will be posting a new tutorial for a little girl's skirt and showing you all of the skirt projects that were created by the other members of the project team. And don't forget that you can link up any skirt projects you have done (past or present) at the Point of View link party on Friday. Hope to see you there! 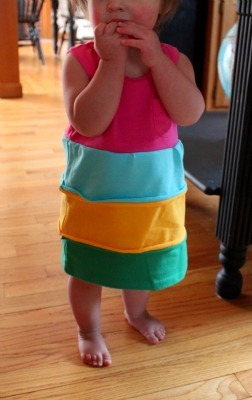 I LOVE this and am totally making one for my own baby girl! Check out my blog when you have a chance for a cute springtime baby hat pattern. :) I'm your newest follower and would love to have you as one of mine! Oh my gosh it turned out so cute! 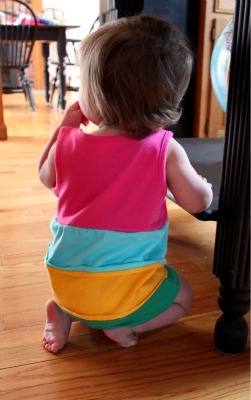 The colors remind me of a yummy icecream cone- perfect for summer! I love the dress! I think I might have to add this one to my to-do list! I like the idea of testing other people's tutorials. I haven't done that in a while, but may have to do it again. Far more relaxing! And you can always put your own spin on it anyway, like the way you used a tank instead of a onesie, and still get the satisfaction of being creative and productive. Lovely project, Gwen! Oh my goodness, I love that! Its adorable. I really like the exposed seams too! I agree with Michele- this is a great idea! I love seeing how other people use tutorials so it gives me more ideas of how to tweak ideas and tutorials. The dress turned out so great! She look adorable in it. This is so adorable! I think the model is pretty darn adorable too with those chubby little arms and legs. I relate with the projects list. There are so many amazing women with great ideas that it is hard to keep track of all the fun projects. Cute! I also have that dress bookmarked for a few baby gifts, but I have been sorely disappointed with my Walmart clearance tshirts. What a great use of tshirts! Love it! Thought you might like to participate, or at least make a cute little dress! That turned out really cute! Love the bright colors! Great deal on the shirts!!!! Turned out great Gwen, fun colour choice. I wonder if this would work with t-shirts which are too small or stained. Really sweet dress, also looks comfy. It's awesome and you totally scored in the clearence section! What a cute and budget friendly dress and because it's made out of such soft material I bet it's going to one of her favorites to wear.